Considering refurbishing your Anechoic Chamber? Comtest designs and builds best-in-class anechoic chambers and EMC testing facilities. Due to the modular nature of our designs, and anechoic chambers in general, it’s also possible to upgrade older anechoic chambers to comply with modern standards. We provide this service for customers across the globe. 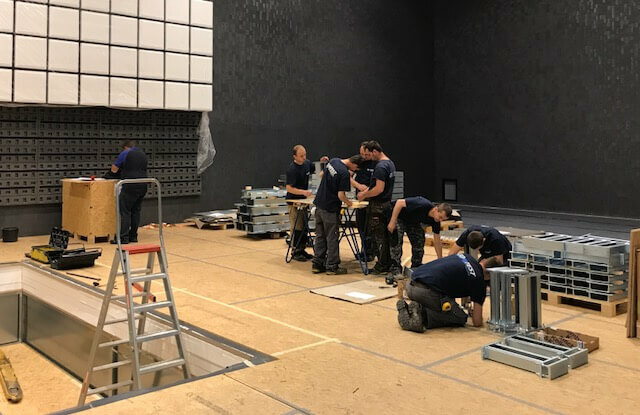 If you want to know more about our anechoic chamber refurbishment service, do not hesitate to contact our technical consultants via the online contact form or by phone. Many chambers built in the 1980ies and 1990ies are equipped with polyurethane absorbing materials, aka foam absorbers. Polyurethane is a material with a limited product life due to the open cell structure. This means that older testing chambers could benefit from upgraded polystyrene absorbers to comply with modern testing standards (again) such as CISPR16-1-4. Besides product life time and closed cell structure, the Comtest polystyrene absorber has more advantages. Read more about our hybrid absorbers here. Contact our technical consultants to explore the options for your existing test chamber using the online forms.